Width: 0.25" 0.5" 0.75" 1" 1.5" 2" 2.5" 3" 3.5" 4" 4.5" 5" 5.5" 6" 6.5"
Height: 0.25" 0.5" 0.75" 1" 1.5" 2" 2.5" 3" 3.5" 4" 4.5" 5" 5.5" 6" 6.5" 7" 7.5" 8" 8.5" 9" 9.5" 10"
Want something else? Visit our custom stamp page! Rubber Trouble is temporarily closed for family reasons. Please check back later to see if we have reopened. Unmounted only -- $3.50 SALE price! Whether it's on a Medieval church or a goth's bookshelf, a gargoyle is kind of cute. Want a smaller one? There's one on this page. Win a $25 or $50 gift certificate! Jennifer Hattori Noll won $50 when her Rubber Trouble-stamped artwork was featured on the cover of Rubber Stamper magazine! If you get published too, you might win as well! See our contest page for details. 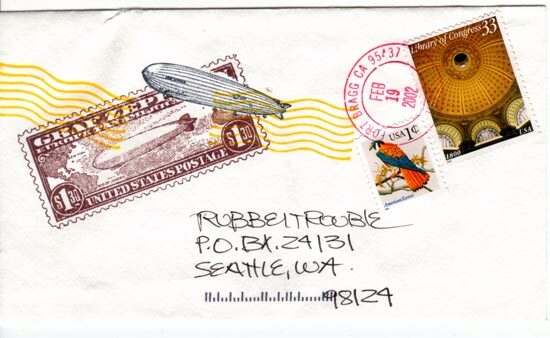 See our stamps in action! The Rubber Trouble Gallery includes examples of cards, tags, necklaces, pins, and other creations made with Rubber Trouble stamps. © 1998-2010 Rubber Trouble. All rights reserved. Litldevl sketch © 1998 by Jason Simpson. Rubber Trouble logo © 1998 by Wendi Dunlap-Simpson and Jason Simpson. 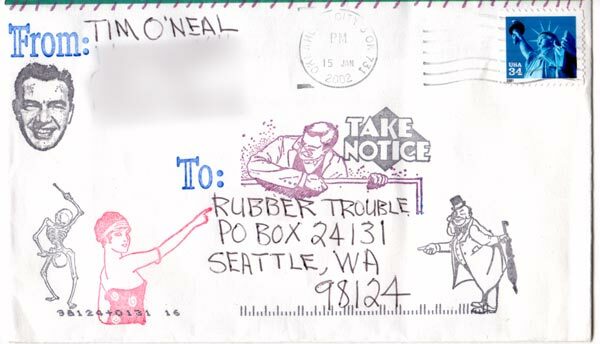 The Rubber Trouble name and logo are trademarks of Rubber Trouble.